The Panel has now considered whether your fitness to practise is impaired by reason of misconduct. The Panel has considered the submissions of 17,000 doctors on the streets in Westminster, all of the major UK newspapers and media television news services, 3000 signatories to the letter of misconduct submitted to the Cabinet Office, the 53,000 junior doctors currently in the UK and 223,000 signatories to the online e-government petition “To debate a vote of no confidence in Jeremy Hunt”. We have also considered submissions from the BMJ, and the Doctors and Dental Remuneration Body. Duties of a doctor: Maintaining trust: Be honest and open and act with integrity. 7. You must be competent in all aspects of your work, including management, research and teaching. 15. You must provide a good standard of practice and care. 36. You must treat colleagues fairly and with respect. 69. When communicating publicly, including speaking to or writing in the media, you must maintain patient confidentiality. In deciding whether your fitness to practise is impaired, the Panel has exercised its own judgement. It has borne in mind its responsibility to protect the public interest and, in particular, to protect patients. The Panel considered whether the admitted and proven facts in your case amounted to misconduct that was so serious as to impair your fitness to practice. Misrepresenting the 2015 Fremantle BMJ paper, ‘11,000’ deaths at the weekend on frequent occasions; Telegraph, BBC, Kings Fund, Guardian. Which may have led to active harm to patients. Misrepresenting the HISLAC data , in a discussion about junior doctors contracts on the Today programme, on the morning of the second Junior Doctor protest. Stating in Parliament ‘No doctor will see a paycut’ in the House of Commons, then immediately backtracking. Claiming the BMA is misleading members – the Panel considered evidence from independent doctors numbering in the tens of thousands on Twitter, and protesting around the country, independent and government petition websites, and newspaper interviews, and found no evidence of BMA ‘misrepresentation’. 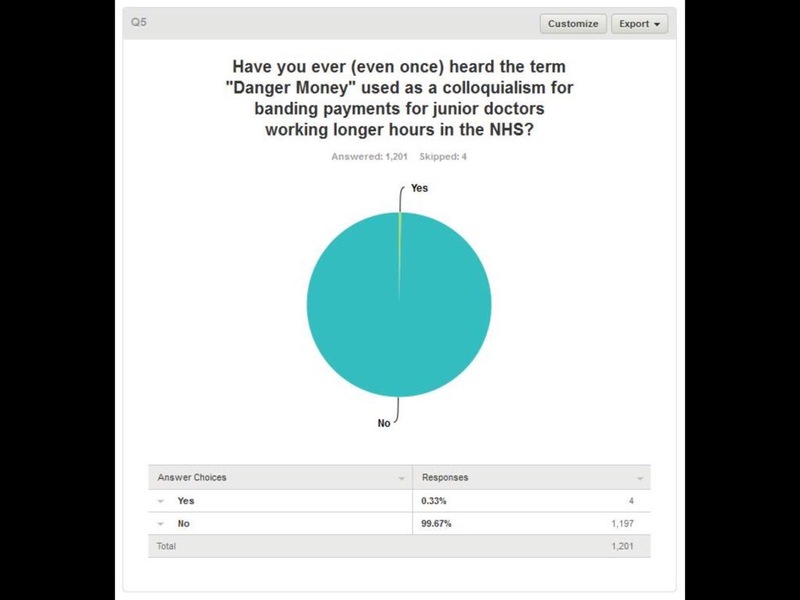 Claiming #Dangermoney is a ‘colloquial‘ term in the NHS- despite 99.67% of 1201 doctors surveyed never having heard the term. In regards to breach of confidentiality: Found proved. You have broken the most fundamental aspect of healthcare, and show no remorse over your behaviour. On July 18th 2015, at 2:34pm, you uploaded a photo to over 70,000 twitter followers which contained the names and operations of several patients at a major London hospital. This Panel considered evidence of the ‘Hunt Effect’ detailing patients coming to active harm having been misinformed by yourself in regards to weekend staffing and safety: formal evidence is still pending. For proposing a contract purported to be ‘safe for patients’ but which removes the fundamental safeguards that protected patients from doctors forced to work overlong hours. Your treatment of your colleagues has been considered: your conduct during the recent Opposition Day debate was inappropriate- disrespectful to fellow MPs and colleagues in the NHS, including walking out halfway through the debate. Your comments regarding the ‘Monday to Friday’ culture of the NHS, your belief that a computer could do a doctors job, your claim that doctors are ‘misled’ by their union, and are incapable of studying the evidence themselves and making their own decisions, your fundamental lack of insight into the entire system you are in charge of. You have not treated colleagues fairly or with respect. A copy of the 2015 Fremantle BMJ paper, torn, and heavily annotated with exclamation marks and maniacal laughter. A copy of the Junior Doctors Contract, which apparently does not yet exist, but is ready to be imposed. The health of 65 million people. This is a brilliant response to the current idiocracy ruling our UK. Jeremy Hunt is the symptom, not the disease – If someone doesn’t start attacking this disease soon, we will all have to deal with Private Health Care and medicine will return to a state of being available only to those of you with deep pockets. No Joke [they’ve already utterly undermined state education and the emergency services]. Please support Junior Doctors (these are people who spent 5 years at Uni, 40 hours pw studying! Compared to many other student lives… Before they even got a job) (and then spend YEARS devoting time and energy to further training to ensure our welfare). Read, share, respond, write to your muppet MP (even if you’ve a tory one), talk about it, anon. There is an army of privateers already creeping into the NHS, already creaming cash off the limited resources, and we are close to calamity with regards the realistic option many doctors will be making soon; to emigrate and leave even more gaps in the machine to be ‘covered’ by privately funded locums / agency staff and worse. I reblogged this on http://www.bujonswords.wordpress.com (it’s a poetry site, but I have a deep seated interest in not losing the NHS). Thanks for your work. Keep on keeping on!